The kit that Barça's first team squad will wear in the 2018/19 was presented to the public on Saturday, in an event attended by both club president Josep Maria Bartomeu and Barcelona mayoress Ada Colau. It took place at the Montjuic swimming pools which became an icon of the city during the 1992 Olympic Games. 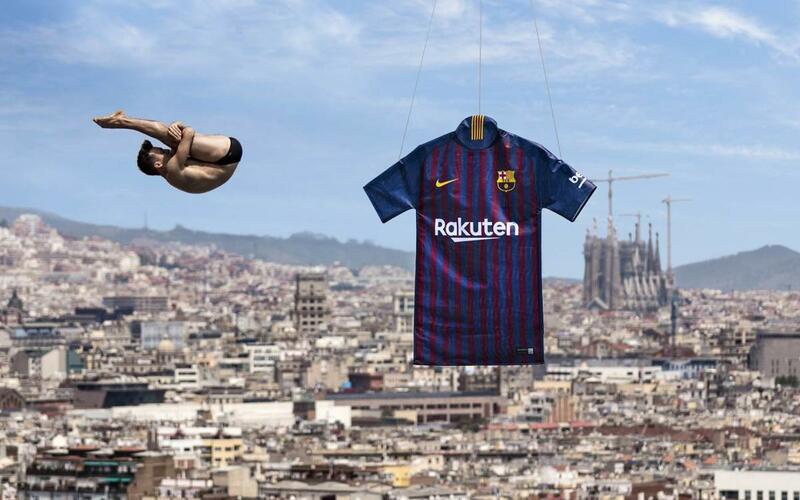 The shirt itself is a homage to Barcelona, with the ten vertical stripes representing its various districts: Ciutat Vella, Eixample, Sants/Montjuïc, les Corts, Sarrià-Sant Gervasi, Gràcia, Horta-Guinardó, Nou Barris, Sant Andreu and Sant Martí. The event began with a freestyle display from four-time Spanish champion Sergi Martínez, who ended his routine by kicking the ball into the water. There, it was collected by a team of ten synchronised swimmers, led by Sara Gijón -bronze medalist in the 2011 World Championships and 8 times Spanish champion- and also consisting of Amber Bakker, Iris Sande, Iris Brunsó, Xènia Sans, Ivet Estrader, Sira Casanova, Vanesa Ligos, Laura Cano and Laia Filella. Diver Adrià Garcia, a three-time Spanish champion in the 10 metres discipline, leapt into the pool, with a giant Barça shirt appearing via drone the moment he hit the water. The combination of his dive and the background of the Barcelona skyline recreated one of the most iconic photos of the 1992 games held in the city. Following Garcia's dive, the synchronised swimmers struck a pose with the ball. Out of the pool were ten people dressed in the new shirt and representing the ten districts of the city. Five of them were from the club: First team player Philipe Coutino; Barça Women's Leila Ouahabi; Barça B's Oriol Busquets and youth players Alexis Olmedo (U-12s A) and Aina Roman (Women's U-14s). The other five were Barça season ticket holders. Josep Maria Bartomeu and Ada Colau closed the shirt presentation with speeches.